1 - Cover girl "cheeks" ($7.49) --- ugh, so the cashier took the foundation off as the free product, GRR! Not the best profit, (damn you CG!) but a profit nonetheless! sometimes it seems like the covergirl is more trouble than it's worth, don't you think? 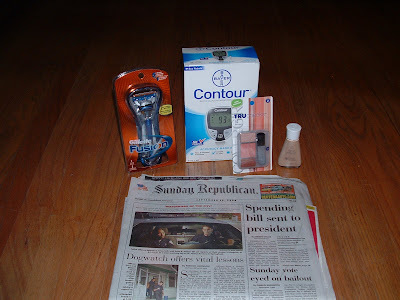 I love reading your shopping deals! Thanks for sharing!!! Beth - Yes, I def agree on the Covergirl! This isn't the first time I've had problems! But I do love free makeup!!!! Thanks Sandi! You're totally right! I will pay attention next time! I was bad, I actually wrote in the price on the CG coupon so they would take off the right price. I got my "hand slapped" for doing it, and said sorry I was just trying to help, but at she took off the right price!